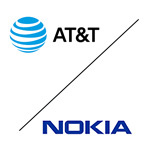 This entry was posted in 5G, IoT and tagged AT&T, Nokia. Bookmark the permalink. AT&T is considered one of the top operators globally in IoT. In the first half of 2017, analyst firm Berg Insights ranked AT&T No. 4 in the world with 36 million cellular IoT connections on its network. China Mobile was ranked No. 1 with 150 million IoT connections followed by Vodafone with 59 million connections. China Unicom was ranked No. 3 with 50 million connections.